The opportunity to combine lighting with acoustics should always be considered as lighting is often applied to the same locations and areas as acoustic products. Commercial serving areas or meeting rooms or break out zones usually have a lighting scheme plotted so if that area is going to be a busy area, noisy area it would make sense to consider he acoustical properties of the lighting scheme above. Some acoustic lighting and lightcovers are made larger than standard sizes lightcovers as they are designed to absorb ambient noise. 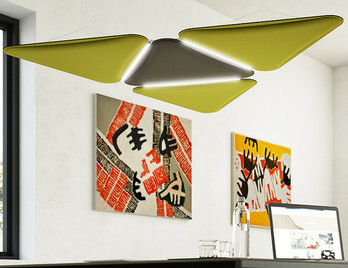 Bell-shaped acoustic, functional felt lighting with a powder coated frame in Black, White or Fluro Yellow. Buzzibell is a felt based acoustic lighting solution which adds a softness to any environment by emanating soft light whilst absorbing hard noise. 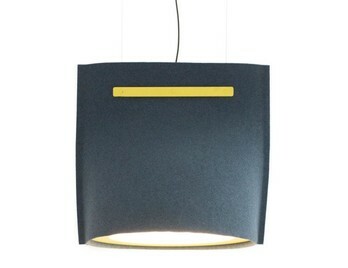 The BuzziShade is all-encompassing sound absorbing overhead funnel type light shade. 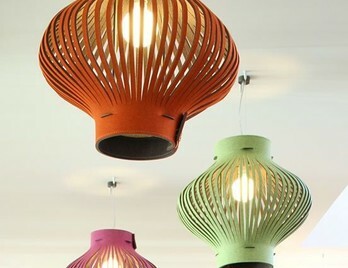 It's designed by The BuzziShade studio and can be used in offices, waiting rooms or restaurants. You can specify the size, frame colour, shade felt colour and lace colour making a BuzziShade a tailor-made solution to suit any environment. 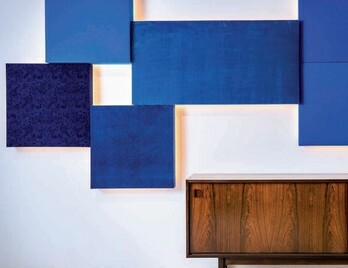 BuzziClipse are subtle indirect lighting wall panels with a high acoustic performance. They are available in variants square and rectangular with led backlight giving you the opportunity to create an acoustic wall of light. 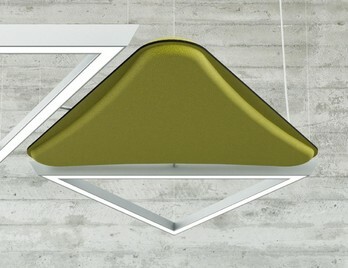 BuzziLight is a striking phenomenon offering elliptical felt strips which are held over an indiscreet metal frame. This gives BuzziLight a gentle aesthetic whilst helping to absorb ambient noise from the surrounding environment. Available in selected two-tone acoustic treated fabric from Pink to Stone Grey, the BuzziLight is a trendsetter in any space. 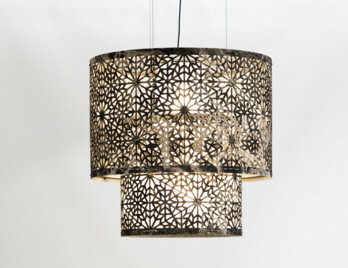 BuzziLight Mono has a single colour of felt both inside and outside with the lace colour in either black or white. Its is a striking phenomenon offering elliptical felt strips which are held over an indiscreet metal frame. This gives BuzziLight a gentle aesthetic whilst helping to absorb ambient noise from the surrounding environment. 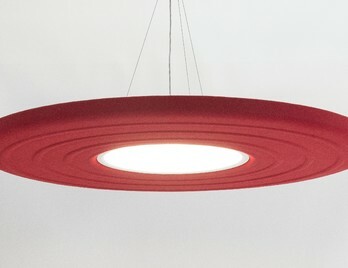 Also available in selected two-tone acoustic treated the BuzziLight is a trendsetter in any space. BuzziChandelier creates a solid focal point whilst adding acoustic softness to a room. Two layers of Buzzifelt combine over a led light source making a striking statement on its own or in multiples for added ambience and romance. BuzziChandelier, therefore, can be used in multiple locations other than the office such as restaurants, hotels, cafes and bars. 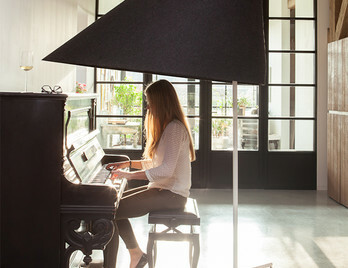 BuzziMoon is an excellent lighting and acoustic solution offering the best of both worlds. It's performance acoustically is equally matched by the LED lighting that the absorbent fabric surrounds. The Moon can be supplied in different fabrics and various 3D patterns. The BuzziShade Large is all-encompassing sound absorbing overhead funnel type light shade. It's been designed by the young Belgium designers Stal Collectief and can be used in offices, waiting rooms or restaurants. You can specify the size, frame colour, shade felt colour and lace colour making a BuzziShade a tailor-made solution to suit any environment. The BuzziShade puts a stop to those eavesdroppers hearing your private conversation whilst reducing external noise levels to a minimum. The BuzziShade Standing is all-encompassing sound absorbing overhead funnel type light shade and is a fantastic addition to any office, waiting room or restaurant. It's been designed with large-scales settings in mind. You can specify the size, frame colour, shade felt colour and lace colour making a BuzziShade a tailor-made solution to suit any environment. The Vox Easy Light is a suspended linear LED strip light designed to elegantly sit in between the lines of The Vox acoustic Panels. It has an aluminium profile with plastic caps and a high-efficiency micro-prismatic diffuser. Vox triangular panels are 40mm thick thermobonded polyester fibre foam moulds wrapped in a commercial grade fabric and available in six colour finish options. The tear-proof edges of Vox panels are laser cut and extremely rigid which gives them a futuristic appearance with subtle detailing. The Vox Tri Light is a triangular suspended linear LED strip light designed to elegantly sit in between the lines of The Vox Acoustic Panels. 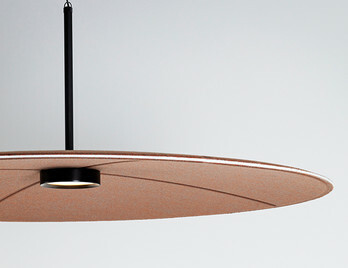 The elegant light has an aluminium profile with plastic caps and a high-efficiency micro-prismatic diffuser. The adjoining Vox panels are 40mm thick thermobonded polyester fibre foam moulds wrapped in a commercial grade fabric and available in six colour finish options. 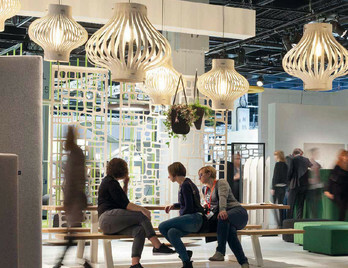 In the pursuit of creating better soundscapes and lighting Lily was created by a collaboration of Norwegian designers Runa Klock and Hallgeir Homstvedt. Lily's name stemmed from early prototypes, which resembled water lily leaves. Since then it has adopted a simpler shape opening it up to broader association. Lily, however, retains a soft organic character with strong geometric forms. 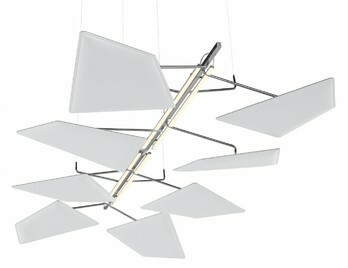 Flap ceiling LED is a unique system to which the shaped baffles or Flaps are anchored on to articulated hinges. The pair of LED strips run parallel either side of the spine of the frame which is modular and therefore can be linked to each other. The panels can be rotated and tilted to make concave or convex configurations depending on the acoustic environmental factors and overall aesthetic.